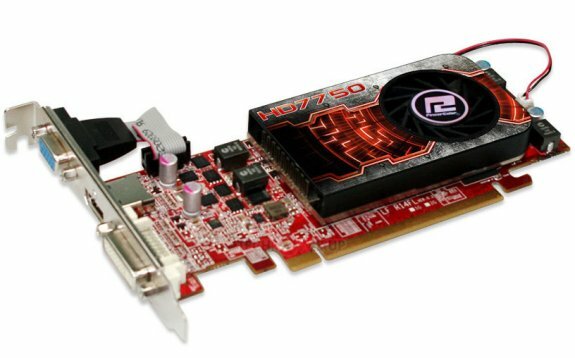 PowerColor introduced a custom-design low-profile Radeon HD 7750 graphics card that uses a single-slot cooling solution. The card features a 800MHz core and 1GB GDDR5 clocked at 4500MHz. Display connectors include dual-link DVI, HDMI 1.4a, and D-Sub (detachable). A low-profile bracket is included in the box. The card relies on a compact air-cooler, which uses a dense hive of aluminum fins, ventilated by a 40 mm lateral-flow fan to cool the 1.5 billion transistor GPU. The card draws power from the PCI-Express slot, and uses high-grade VRM components (such as CPL-made chokes, LFPAK MOSFETs, etc.,) to condition power at minimal board footprint.